Our goal is to make the communication between you and your customers as productive as possible. That's why we are pleased to present you with Wiremo triggers, the fastest and easiest way to say "thank you" to a customer for their review or to solve a customer's issue immediately. For an easier way to setup Wiremo triggers on your website, you can watch the following video tutorial or follow the steps below it. There are two types of triggers: Open Pop-up and Open Conversation. The Open Pop-up option allows you to show an instant "thank you" message to your reviewers. You can edit the text and adjust the color so your pop-up will fit perfectly with your website’s design. 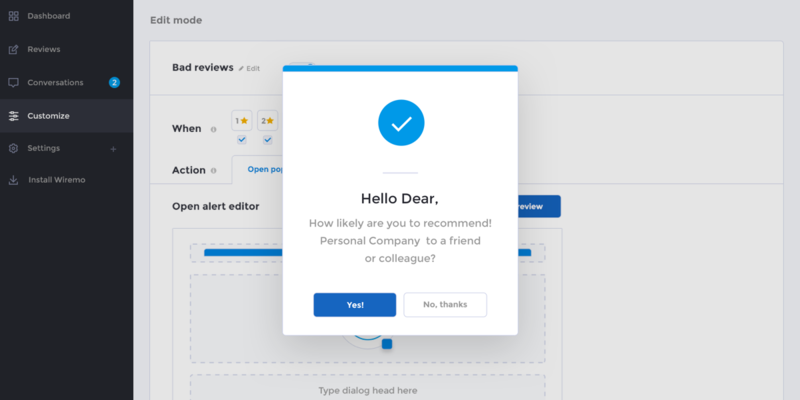 The Open Conversation trigger was created to help you get in touch with customers who wrote a bad review. 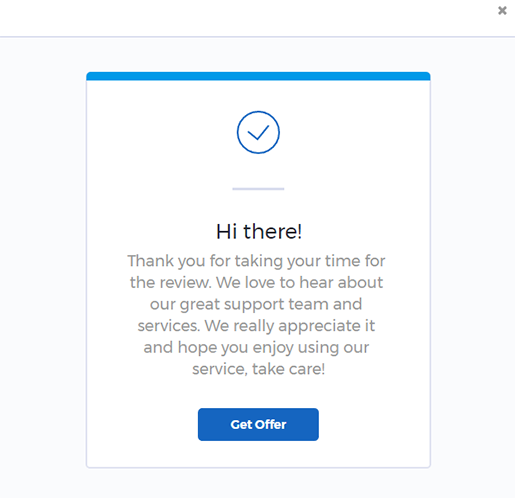 It will automatically open a conversation where you can ask the reasons for such a low rating and offer to help them. Let's see these triggers in more detail. To find the triggers, go to your Wiremo Dashboard. Then click on Tools and select Triggers (pin 1). As you can see in the screenshot below, there you should find two predefined triggers (pin 2). They're defaulted to be off (pin 3). One is "Conversation For Bad Reviews" for when a customer gives a rating of 1, and another is "Thank you! | Rating 5." You can edit them as you wish or create new ones. To create a new trigger, click on the "+Add" button (pin 4). 1. Once you create a trigger, you will have to configure it. You can edit the name by clicking on the edit link (pin 5). To start or pause the trigger, just click on the status jumper (pin 6). 2. Now select the rating for which you want the trigger to react (pin 4). You can select multiple ratings for one trigger. 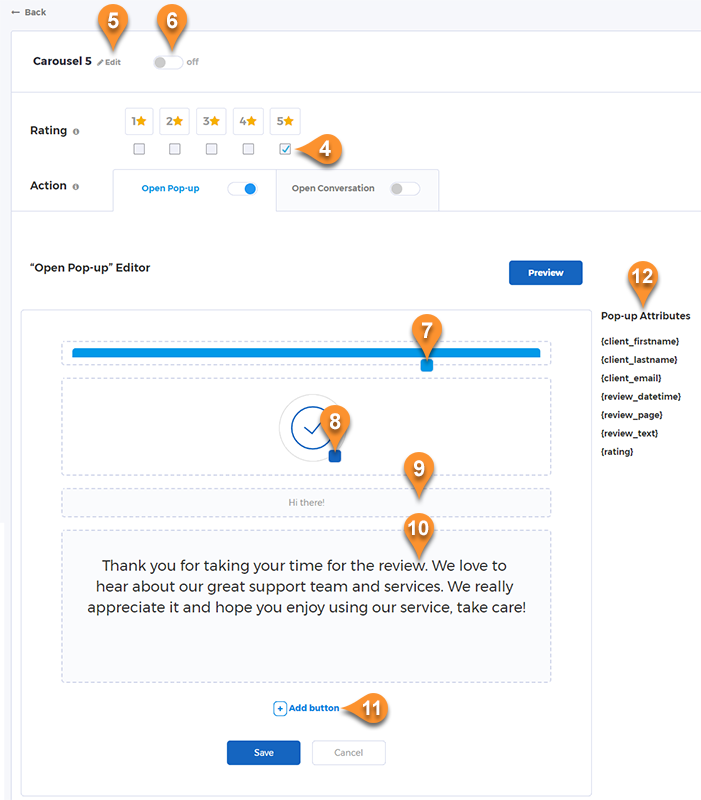 But please note that you must set a specific rating for an Open Pop-up trigger and a different one for Open Conversation trigger. If you already have a trigger for a specific rating and try to create a new one, you will be notified. 3. Once the general setup is done, you can start to adjust your pop-up design. You can change the colors of the header bar (pin 7) and icon (pin 8). Of course, you have full access to edit the header text (pin 9) and main text (pin 10). 4. If you want to redirect the client to a specific page, you can add a link or add one or two buttons by clicking on the "Add button" link (pin 11). 5. Also we've added "Pop-up Attributes" (pin 12). These are small shortcuts that will help you make your Pop-up message more friendly. Just click on the Attribute you need and it will be added automatically into the text. You can add: Clients First and Last Name, e-mail, your client review text, date and rating and also place the link your customers reviews page. 6. Once you are done adding a button, you can adjust it too (pin 13). 7. When you have finished all your adjustments, you can click on the "Preview" button to see how your trigger will look when live. 8. Don't forget to click the "Save" button. Sometimes businesses don't want to bother their clients with pop-ups and would rather tell them "thank you" in a private way or offer to help them solve an issue indicated by their rating. This is where the Wiremo Open Conversation trigger comes in. The main settings for this kind of trigger are the same as for the Pop-up: title, status and rating. As you can see in the image below, the difference is in the predefined conversation message. By clicking on the Open Conversation tab (pin 1), you will find two text fields. One is for the conversation subject (pin 2), and another for the conversation message (pin 3). 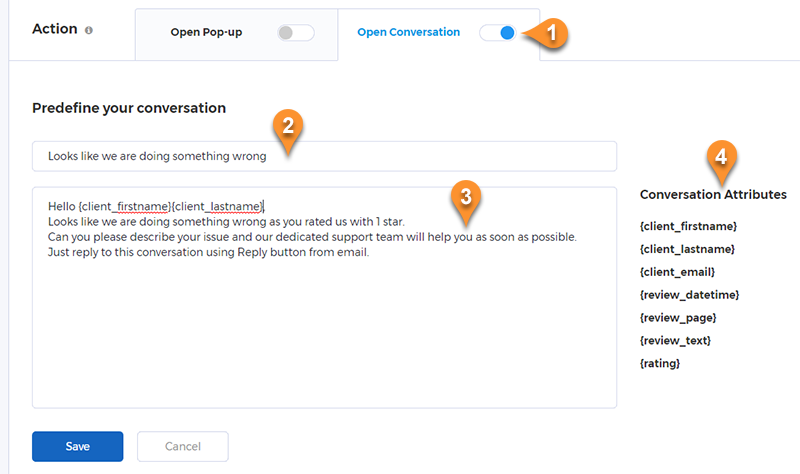 Same as for Pop-up, we've added "Conversation Attributes" (pin 4). These are small shortcuts that will help you to write your message more friendly. Just click on the Attribute you need and it will be added automatically into the text. You can add: Clients First and Last Name, e-mail, your client review text, date and rating and also place the link your customers reviews page. That's it. Set up your Wiremo triggers now and get closer to your customers because Wiremo is the shortest distance between you and your customer.